As you know, to purchase something on your site, a customer must have a bank card or some other account with electronic funds. This is your usual way to receive money from customers – through a payment processor. On your site with Life’s A Deal you can receive money in 2 ways: with online and offline payment methods. Online payment processor allows you to receive funds from customer directly to your bank account. Though, not all customers have a possibility to make an online payment for the product or service they want to purchase. It depends on the location you operate in, on the preferences of your audience, on its age category, etc. Like any business, you would not want to loose a customer who is ready to pay the money. That is why Life’s A Deal has integrated a way to pay for the deals offline – cash on delivery method. How does it work for a customer? Comments – optional field where buyer can leave additional requirements, specifications, etc. After filling in the form, customer clicks “Purchase” and the request for cash on delivery is created. The confirmation e-mail for the request is sent to customer’s e-mail address. How does it work for the business? Once the request is created, website admin will receive a notification to his/her e-mail address. It is supposed that the admin (or other business representative) will contact the customer and confirm the request for cash on delivery. If all is fine, the request should be approved on the site using Approve button for the certain order on the Awaiting approvaltab of the Orders page for the deal. When the Approve button is clicked for the order, the order is being Activated and is considered to be successful (the transaction fee is applied, the coupon is generated if the deal was of Events or Services kind). After that the business should deliver the order to the customer and collect money for it. What if after making request for COD customer changed the mind and did not confirm the order? It may be that when contacting the customer after he/she made a request for cash on delivery, the customer changes his/her mind and cancels the request. In this case the business should not click Approve button on this order and should wait for it to cancel automatically. The button Approve is available on the order within 48 hours. If the order does not get approved within this period, the order will automatically expire. Does this option work for all deal kinds? Possibility to request a cash on delivery purchase is available for Goods, Services and Events deals. For goods deals the process is quite straightforward, as customer purchases physical items to be shipped and the only difference is that with cash on delivery customer will pay the money after receiving items. For services and events deals customer purchases a coupon and will pay for it when it is delivered. The option does not work for electronic vouchers, because there is nothing to deliver to the customer, as the electronic code is supposed to be sent by e-mail. How does cash on delivery work with coupons? Customer leaves the request for cash on delivery. Admin receives the request, contacts the customer and approves the order. When approved, coupon is generated for the order. Admin should download the coupon, print it and then deliver to the customer as a cash on delivery purchase. Note: coupons for cash on delivery purchases are generated only at the time when the order is approved. Coupons are not sent to the customer and are not available for download from the account on the site. The only way for the customer to get this coupon, would be to receive it printed when delivered. This ascertains that customers will not get the purchased item before they pay and will not be able to fraud. How to set up this purchase method on the site? Like a regular payment processor, cash on delivery method is setup through Payment tab of Settings page in Admin section. 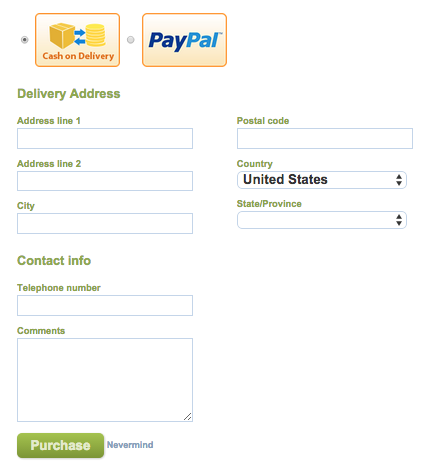 Click New payment system button and choose Cash on delivery from the list. Now, as it is enabled on your site, customers will be able to choose this offline payment way when placing an order. Note: you should understand that by adding cash on delivery system you agree to process offline payments. Money will be received from the customer when the item is shipped. You will need to manage logistics somehow and maybe charge an extra amount for the courier delivery. Why cash on delivery requests do not appear in the order list on a deal? As you know, the order list for a deal shows only successful orders. While not approved, cash on delivery request is considered to be pending, not yet successful. That is why it appears neither in the list of orders, nor in CSV file. Moreover, the transaction fee does not apply when these requests are created, it only applies when the order is approved by administrator. All the requests for cash on delivery are displayed on Awaiting approval tab of Orders for a certain deal. Payment to Life’s A Deal when accepting Cash on Delivery! !